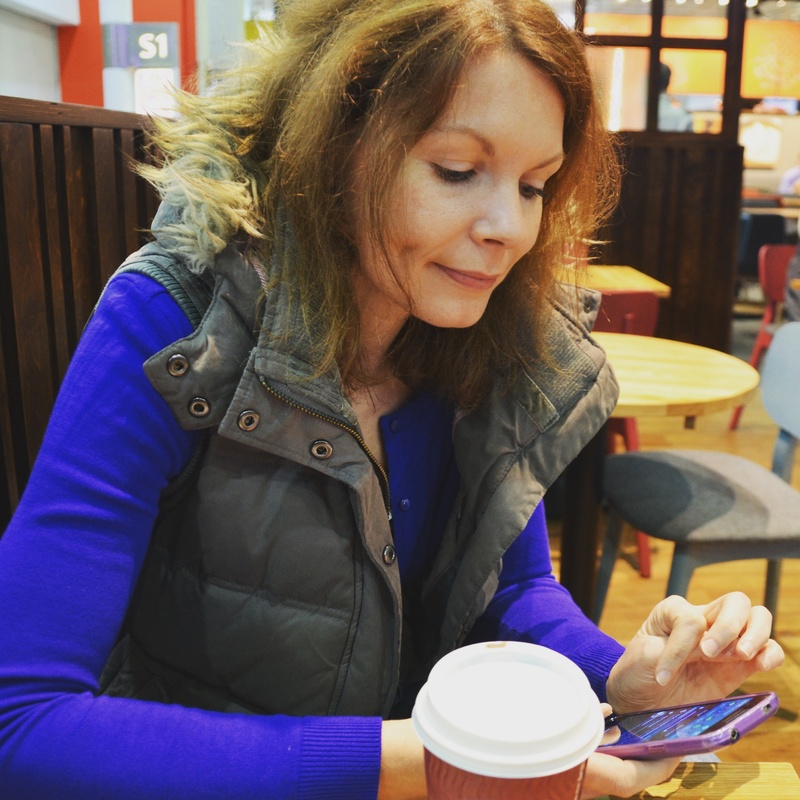 There are million things I love about living in London, if you’ve read even just one or two posts on the blog you’ve possibly figured that out already. 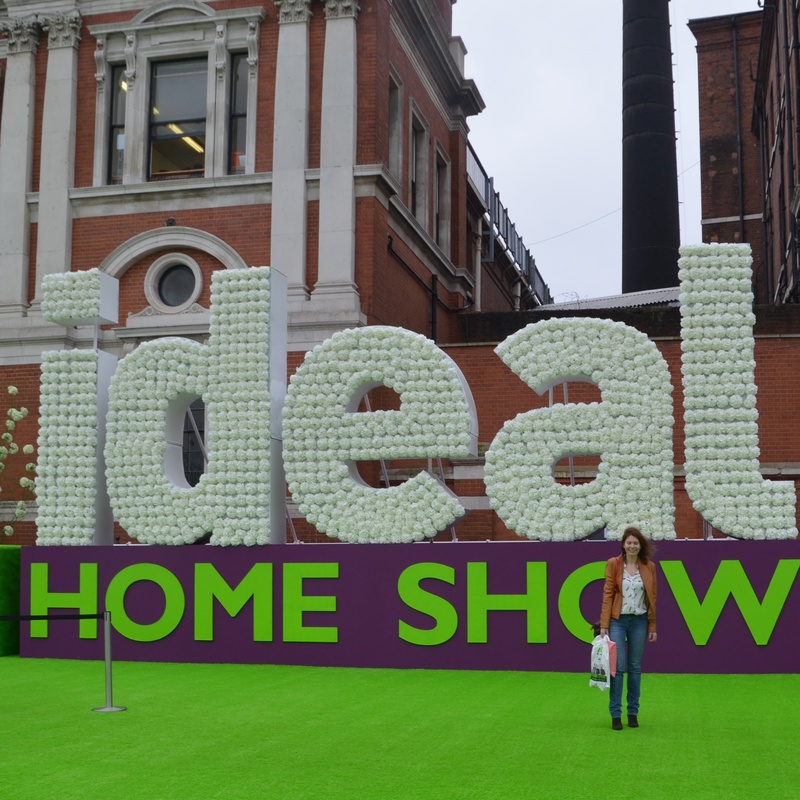 One of them is that even after 14 years here there is so much still to discover and with that in mind we popped to the Ideal Home Show recently for the.very.first.time. It was a chilly and damp Easter Saturday morning but heading inside I couldn’t believe just how much there was to take in – my day job takes part in an exhibition there in June so I’m totally familiar with the venue but have never seen it opened up to it’s maximum capacity and now understand why the show is on for a few weeks as I could have easily spent several days mooching round. 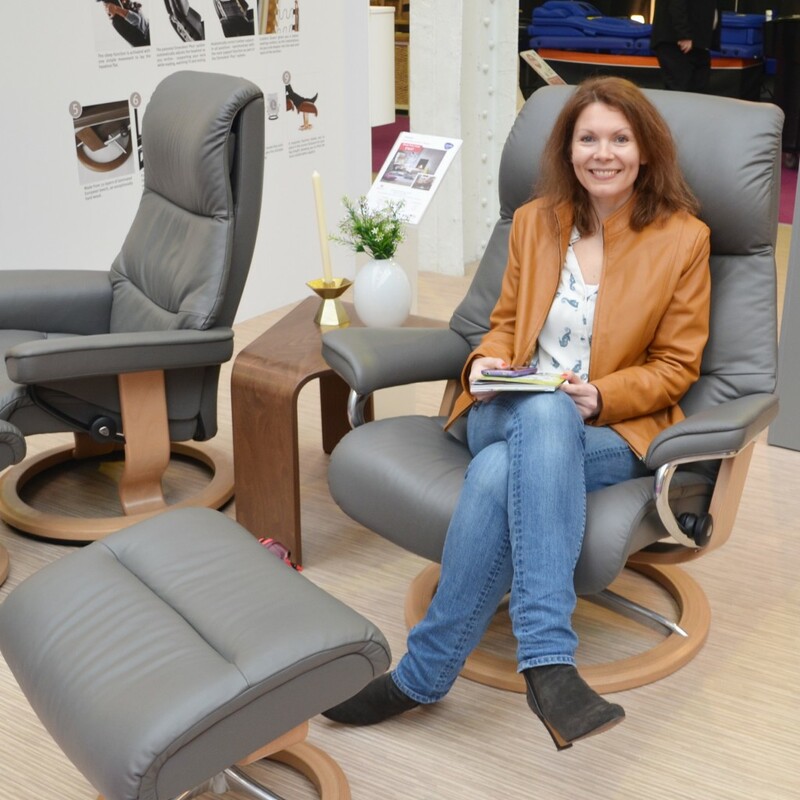 Amongst all of the general browsing and ideas for things we now must have for the house which we can’t afford, our primary destination was the stand of Ekornes-Stressless who had kindly invited us to the exhibition to see their stunning furniture collection in person. Hailing from Norway, Ekornes was established primarily as a mattress manufacturer in the 1930s before adding to their range in the 60’s with an inaugural collection of lounge furniture. 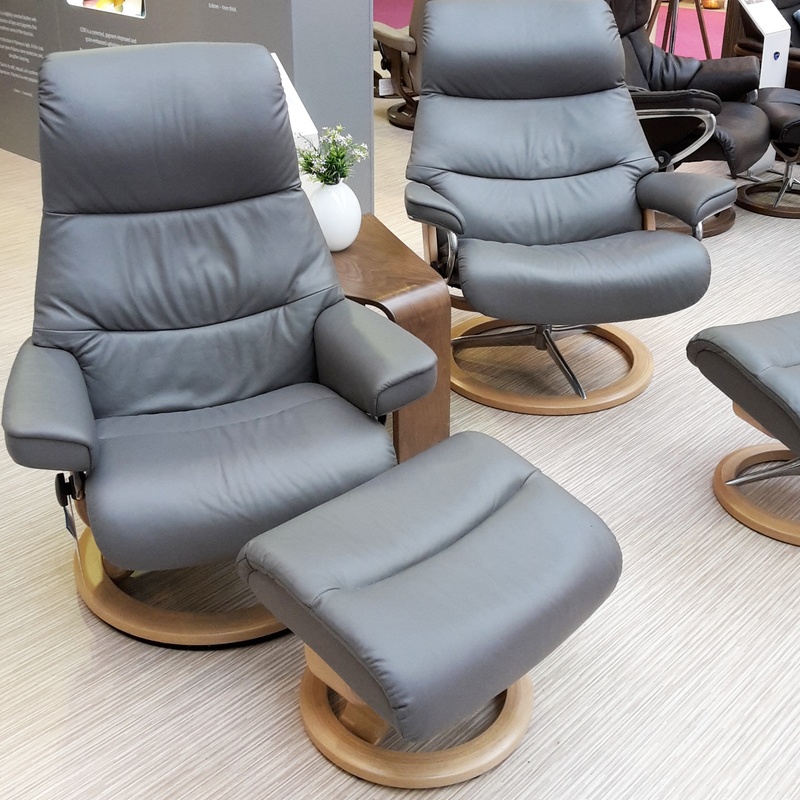 The Stressless, a first real TV chair, launched in 1971 and became an instant success and now 45 years later Ekornes-Stressless are amongst the leading manufacturers of reclining chairs. 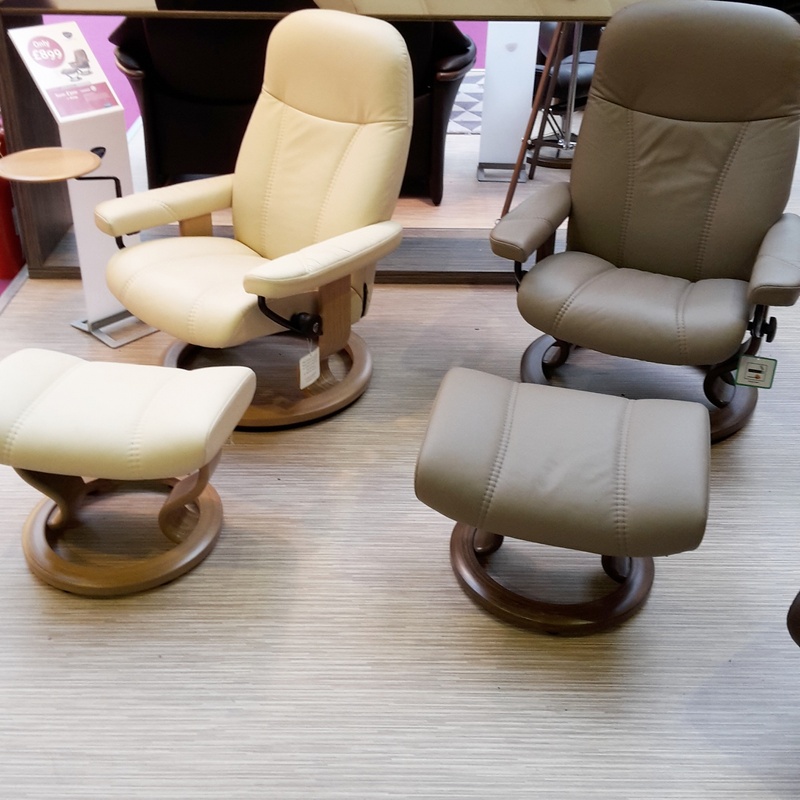 Ekornes had a huge stand displaying the entire Stressless range which now includes recliners, sofas, office chairs, cinema lounging and suites. 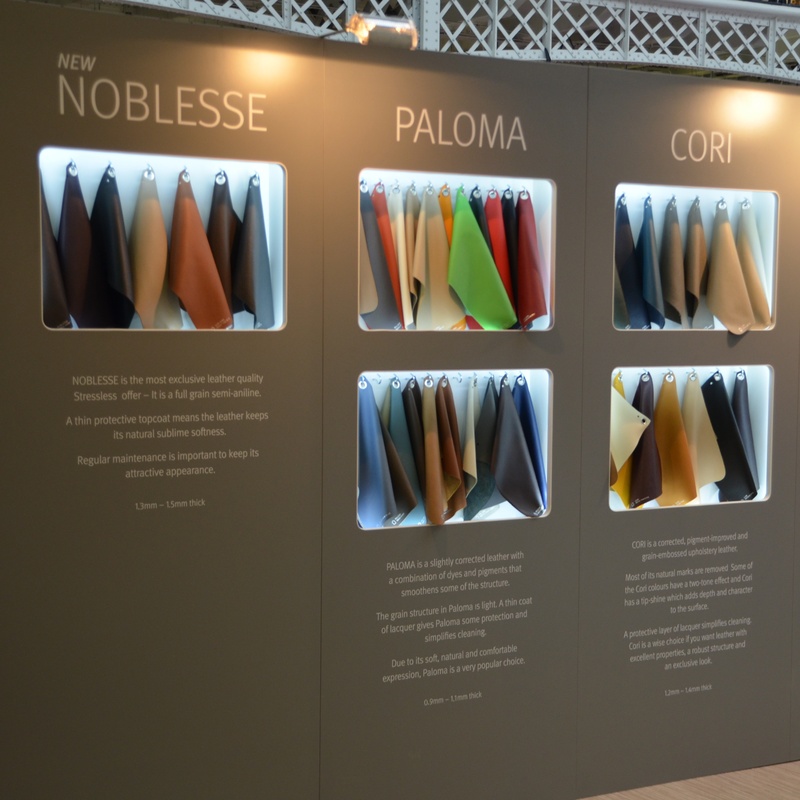 The style is modern, clean and functional – being leather they are incredibly soft and comfortable but it does rule out pattern on your furniture since the leathers can only be printed in block colours. 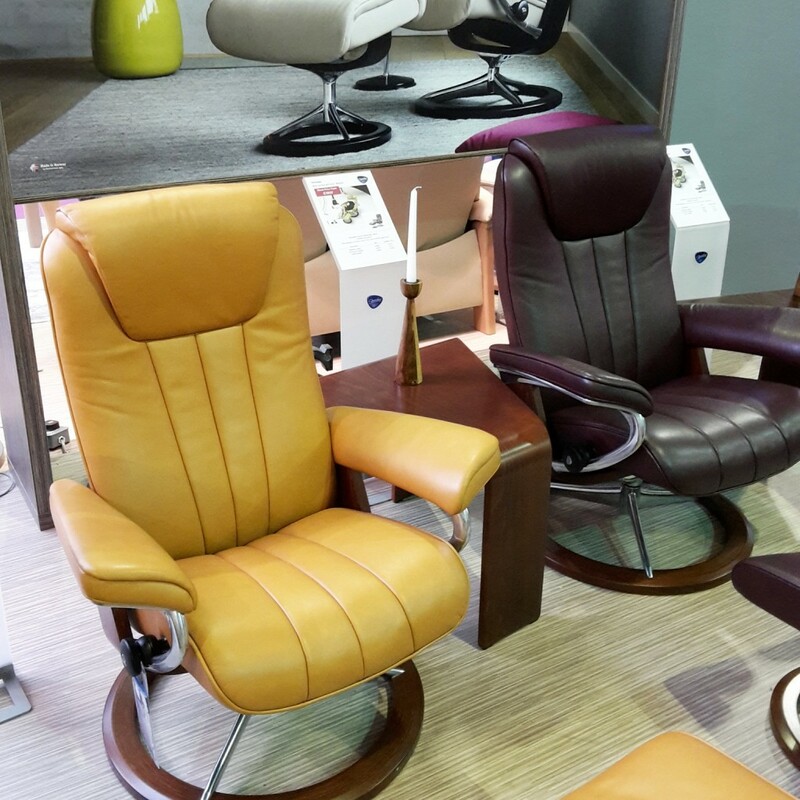 However that is no limitation to finding the perfect piece for your home since the colour palette on offer is very extensive and I absolutely adore this vibrant yellow Stressless Jazz recliner. 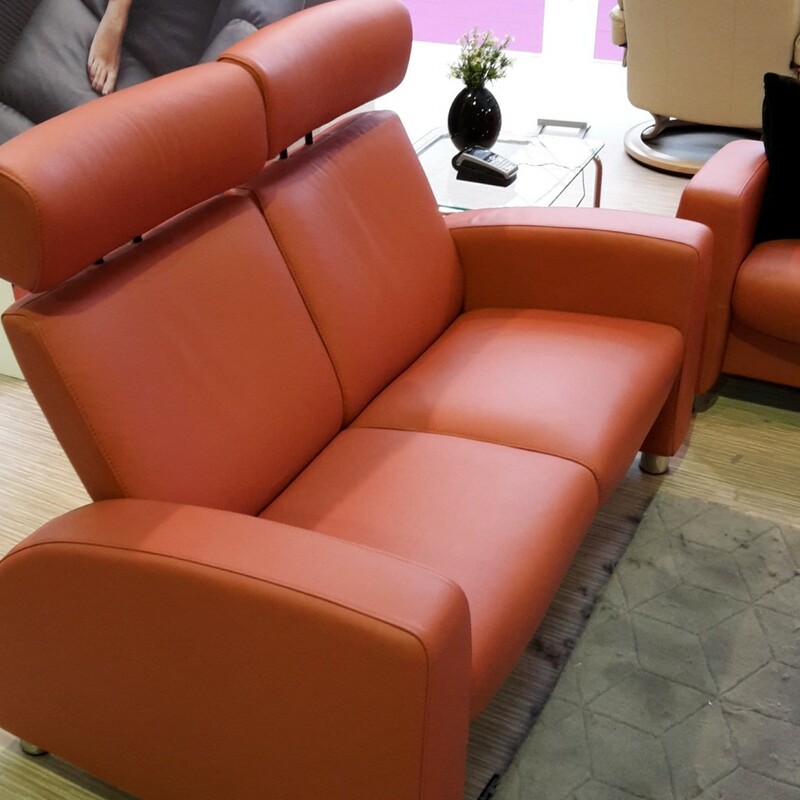 As you would expect from a premium brand, every last detail has been thought of from the smallest stitches to the overall ergonomic composition of the furniture which is clearly what’s made the appeal so long-lasting and achieved global reach since manufacturing began. 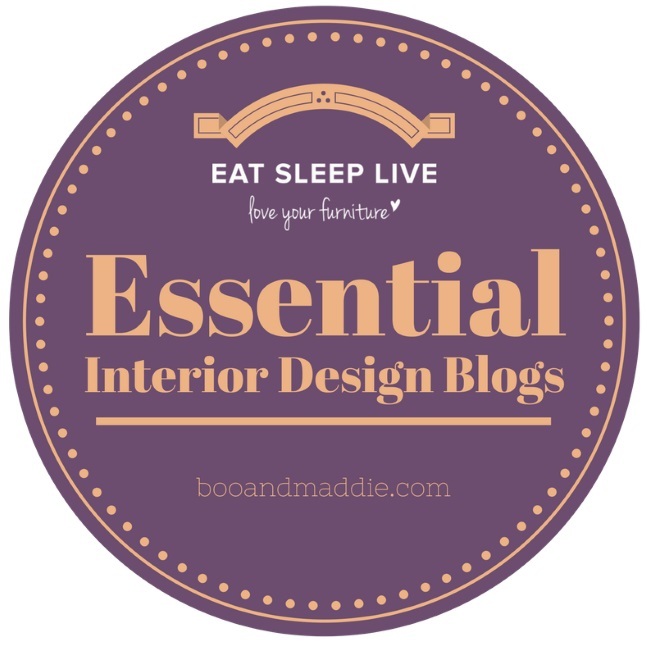 Even if leather isn’t your thing and I absolutely appreciate that it isn’t for everyone, the pieces just ooze luxury in such a way that you might just be tempted to change your mind. Unfortunately our living room is a little on the small side but I’d love a feature comfy seating area once we extend the house to build a new kitchen-diner and one of the seating suites would be ideal for what I imagine will probably be a fairly contemporary-designed space. 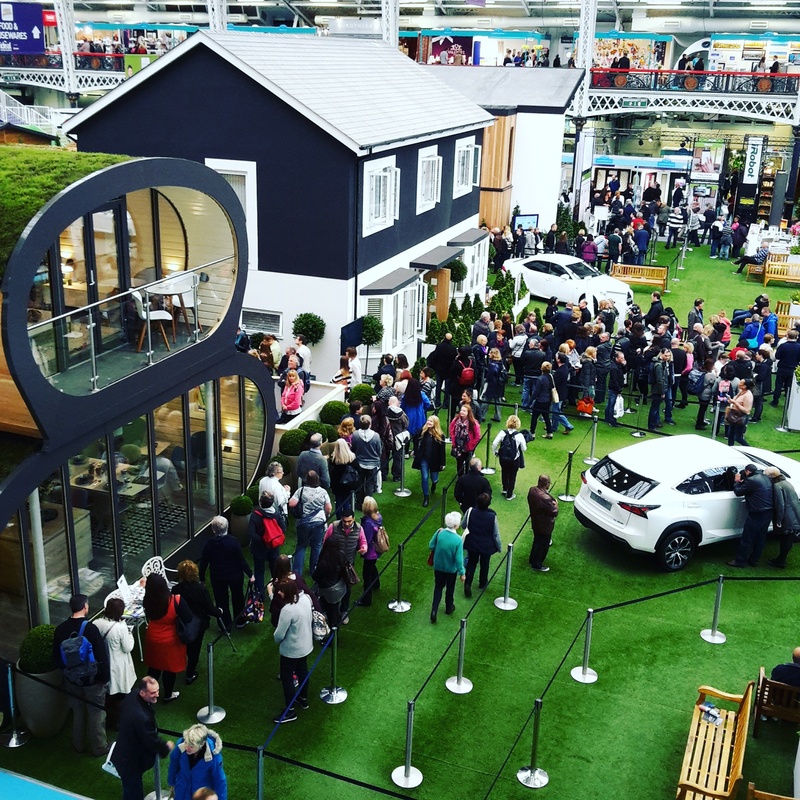 A hugely welcome haven of rest and relaxation amongst the frenetic pace of interiors and home lovers, I could have spent all day moving from one chair to the next to the next. I know that Pete very definitely has his eye on a “man-chair” that he’ll find a way to get into our home one way or another…just so long as he co-ordinates it with my jacket we’ll be fine. 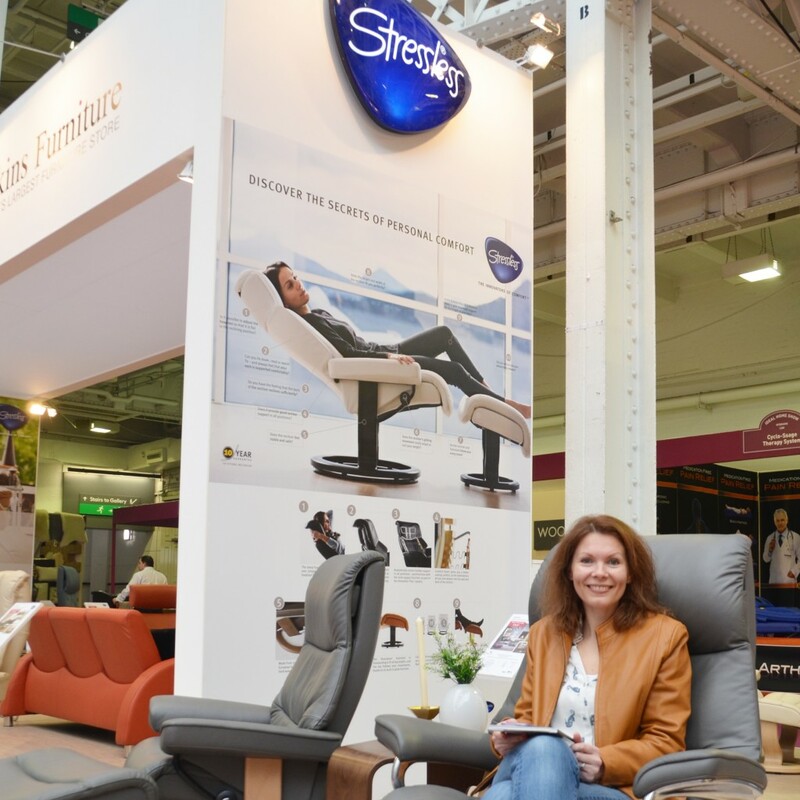 Thank you so much to Ekornes for inviting us to the Ideal Home Show free of charge. 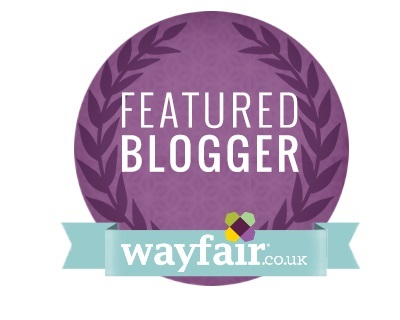 The exhibition is on until Sunday 3rd April so still time to visit! All images, words and opinions are my own.